This is about Atlanta skyline #031Z night watercolor downtown., which is for sale at discount with prints by artist Stephen F. Condren, BFA-SAIC, of Condren Galleries, a Fine Arts Gallery, offering JPEG & PDF scans. This article is about my watercolor painting of downtown Atlanta, Georgia, at night. Take extra art supplies and food with a blanket. Study the city lights and take in all their ranges of color. A most difficult task indeed, doing a watercolor of the city at night, but it is done. The one thing that I had to watch out for at all time was the loss of detail in the watercolor washes. In other words, as I applied the washes of color to the paper I had to do it in such a way as to keep the lines clear and not muddied over. It is amazing how even a light clear stroke can cloud up a pen & ink line! It is all about lights and street lights to be exact. With the son far gone you need the source of the street and traffic lights to illuminate your skyline by reflecting their shine onto and around the building. The light of course pours into the sky but this is very difficult to catch because in the process you can muddy up details of the structure to capture a vapor. It is sort of like stepping on dollars to pick up dimes. Just go with the flow of light as you see it and then put it down on paper, do not be concerned with be so exact and precise ~ this is what watercolors are all about! 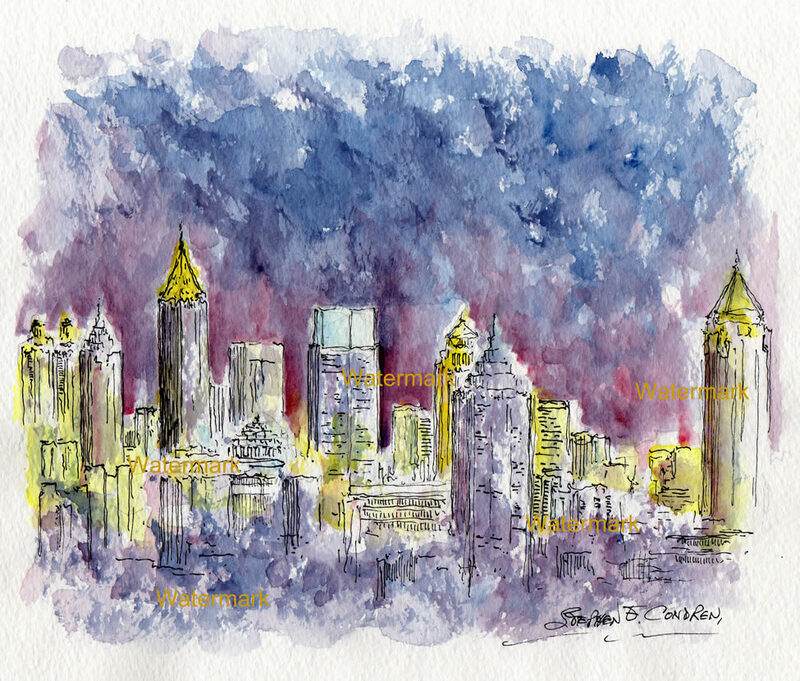 This article is about Atlanta skyline #030Z sunset watercolor, which is for sale at discount with prints by artist Stephen F. Condren, BFA-SAIC, of Condren Galleries, a Fine Arts Gallery, offering JPEG & PDF scans. This article is about my sunset watercolor paint of Piedmont Park in midtown Atlanta, Georgia. This watercolor is a joy and reflects my feeling about the great and wonderful city of Atlanta. I wanted the color of the sky to be the dominant element of this watercolor from the start. Therefore, I had to diminish the detailing of the landscape and skyscrapers so as not to draw attention to them. The looser the better because nothing in this seen is looser than the gases of the atmosphere which is man manifest in the vast colors of the setting sun. It is all about color and space not line. If you think of opera you will know that the musicians are the support element of the opera and the voice is the main element. Though the orchestral themes can be very powerful and grand they should never upstage the voices on stage. The same holds true in this context of watercolor painting. It is my intention to have the watercolor, especially in sky, be the voice of the painting, and that the line that form the buildings and landscape is the orchestra. This article is about Atlanta skyline #029Z watercolor sunset Piedmont, which is for sale at discount with prints by artist Stephen F. Condren, BFA-SAIC, of Condren Galleries, a Fine Arts Gallery, offering JPEG & PDF scans. This article is about my red pen & ink night time watercolor of Piedmont Park, midtown Atlanta, Georgia. This watercolor was difficult to execute do to the fact that the water of Lake Clara Meed becomes the same tone as the evening sky. Thus, I had to work more with the ink to bring out the contour of the buildings in the background and the structure of the trees and bushes on the shore. I used extra ink via cross hatching along the shore’s edge to delineate the land from the water. The bottom third of the watercolor is devoted to the lagoon. I have made the blue of the water a bit darker than the sky since it has no luminosity from the city lights to ease the darkness. If you look carefully you can see that directly behind the buildings the sky is lightest and then as you move your eyes upward the sky darkens into the clouds. This is all due to the city light in the background and from downtown Atlanta, which is not so far off. 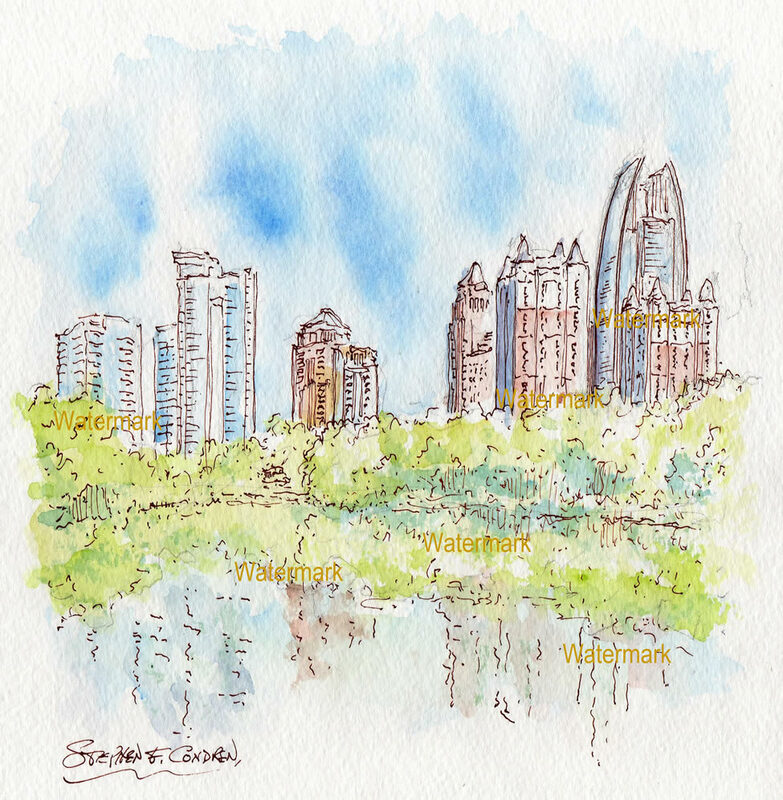 This article is about Atlanta skyline #028Z watercolor Piedmont Park, which is for sale at discount with prints by artist Stephen F. Condren, BFA-SAIC, of Condren Galleries, a Fine Arts Gallery, offering JPEG & PDF scans. 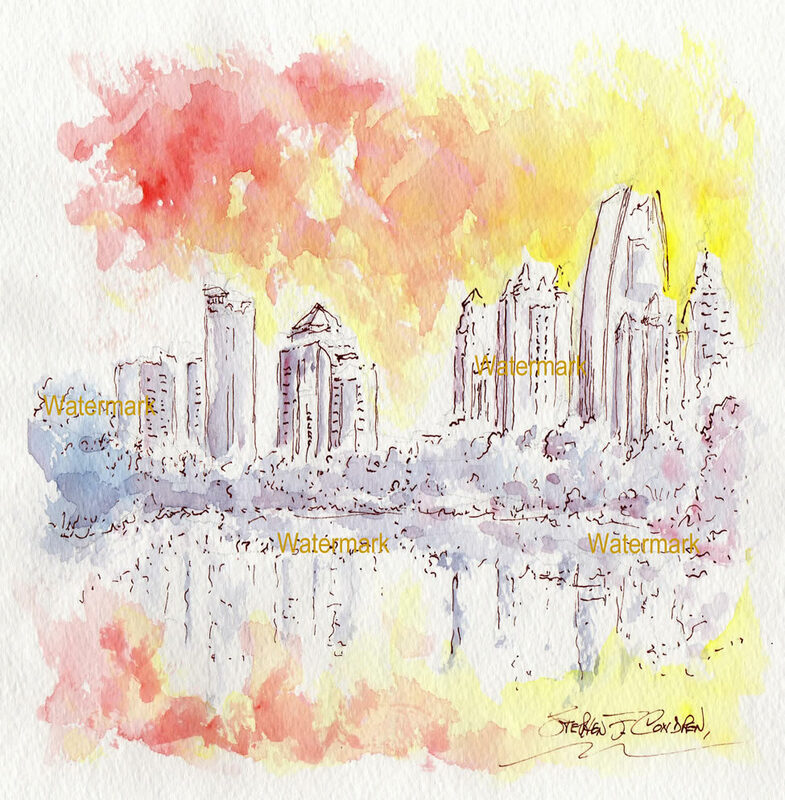 This article is about my watercolor painting of the Piedmont Park skyline in midtown Atlanta, Georgia. This lovely watercolor is from the edge of Lake Clara Meer looking toward the midtown skyscrapers. I have carefully done the watercolor of the water so that it reflects both the trees and the buildings in the background. I have made it a point not to use very much ink in this painting and let the watercolors have the stage. The horizon line is gently below the center so that the base of the buildings would be adequately supported by the image of the trees and the reflections in the water. The green is heavily mixed with lemon yellow to give a lighter tone to the foliage. 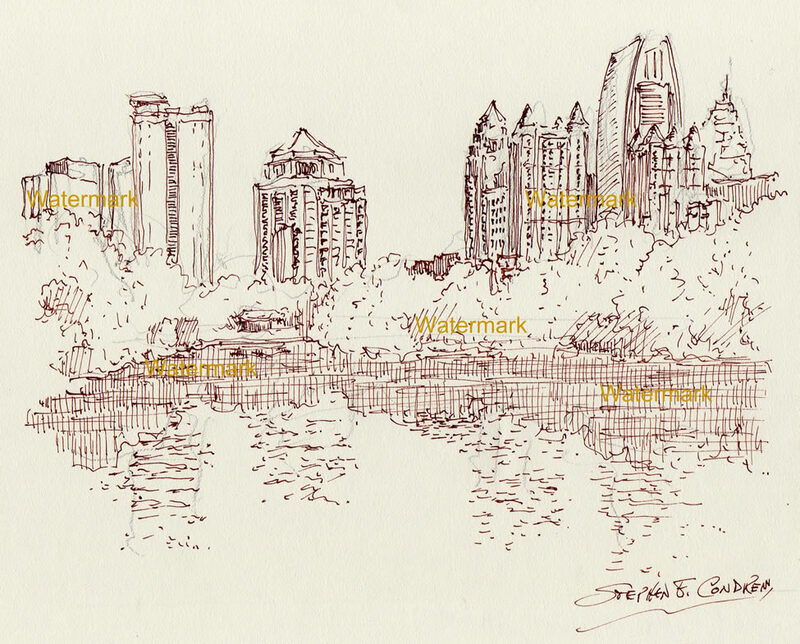 This article is abut Atlanta skyline #027Z brown pen & ink drawing of Piedmont Park, which is for sale at discount with prints by artist Stephen F. Condren, BFA-SAIC, of Condren Galleries, a Fine Arts Gallery, offering JPEG & PDF scans. This article is about my brown pen & ink drawing of Piedmont Park in Atlanta, Georgia. Have extra supplies and food on hand. Study the contour of the trees with the skyscrapers. Make use of cross hatching for deeper tones. The brown ink that I have employed for this drawing has worked very well for me. The tone of the ink goes will with the light brown paper and the shadows in the drawing all compliment this tone. I am very will pleased with how well cross hatching has made Lake Clara Meer look so alive. When I look at this drawing all that I can see is the stirring of the lagoon. The skyscrapers in the background almost seem to grow out of the landscape. The use of ink details in the shrubs and trees is very will executed and convinces the viewer that this is truly a tranquil place. This article is about Atlanta skyline #026Z pen & ink of midtown, which is for sale at discount with prints by artist Stephen F. Condren, BFA-SAIC, of Condren Galleries, a Fine Arts Gallery, offering JPEG & PDF scans. 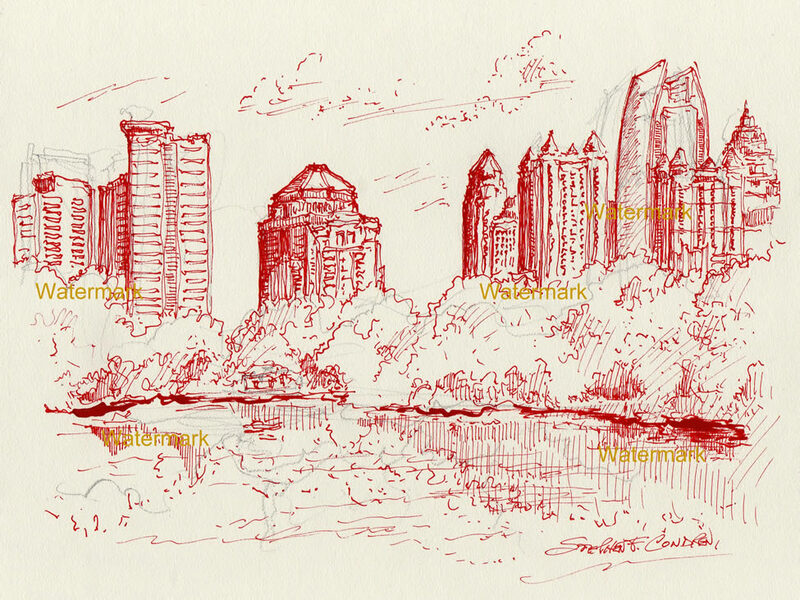 This article is about my red pen & ink drawing of the Atlanta, Georgia, skyline at Piedmont Park. Have all of you art supplies in order and extra stocks of it. Study the movement of the water. Watch the time of day and calculate the time for the angle of the sun. Regarding the angle of the sun, which is very important, be sure to have the rays of light working with you and on the subject. Do not have the subject in shadows. It is amazing how often I encounter artist drawing their subject in the shade. Much of the time this was due to poor calculation of time, for as the day passes the sun moves and soon they find that their subject is in the shade. Make sure that you give yourself time! In this red pen & ink drawing I have made use of the suns rays which in this drawing are coming in from behind me over and to the right. The shade of the buildings in the back ground reflect this. I am very please with my handling of the motion of the water. When you look at the center you can see how the strokes of ink have dissipated. Keep in mind that loose following lines work better for you on water than cross hatching. Hatching is best utilized in places such as under the trees on the shore line. All in all the clarity of line work in the drawing is very good and has rendered the landscape of Piedmont Park admirably. 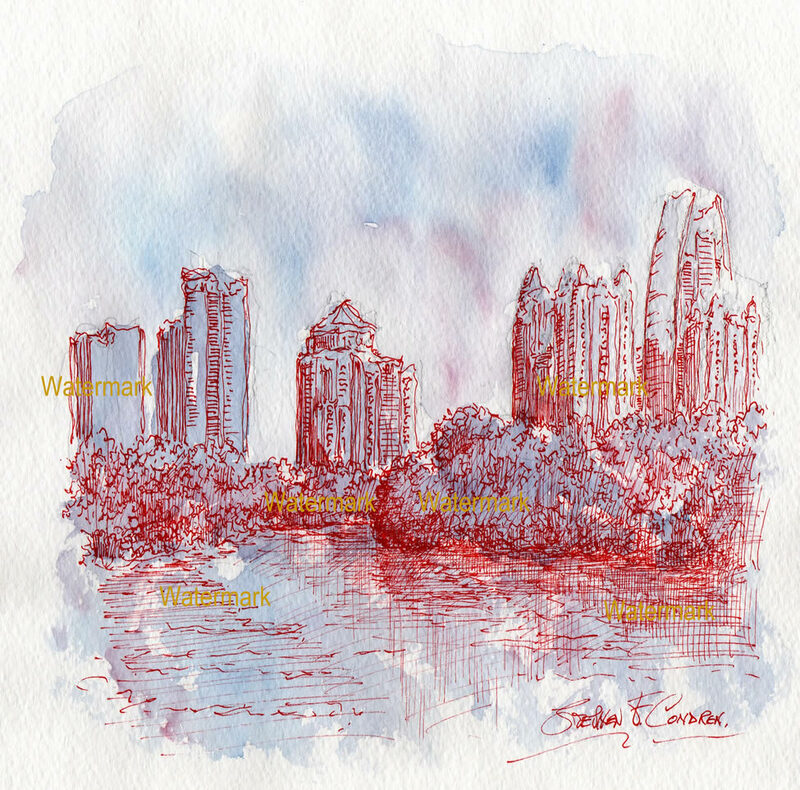 This article is about Atlanta skyline #025Z pen & ink drawing, which is for sale at discount with prints by artist Stephen F. Condren, BFA-SAIC, of Condren Galleries, a Fine Arts Gallery, offering JPEG & PDF scans. This article is about my pen & ink night time drawing of Lake Clara Meer at Piedmont Park, in Atlanta, Georgia. Have all of your art supplied and gear in place. Bring lighting to allow you to work. Spend a long time looking at the city lights to understand the contour of the buildings. It is not a common practice to do landscape drawings at night. However, if you are only in town for a short time take advantage of this. It is my practice to do as much as I can in the short time that I am usually in places. It is amazing just how much that you can see at night when you have set up your easel or table. There are many kinds of lighting fixtures to choose from. One you have your lighting in place it is quiet easy to work. The flip side of the coin however, is that you need to keep your working light at a lower than usual level of brightness because you need to be able to see out into the dark and thus your pupils need to dilate to take in that light. If you have bright lights on around you, then you will not be able to focus on things out in the darkness. Cross hatching is king! In this pen & ink drawing cross hatching has become indispensable due to the darkness. However, you cannot let the darkness take over. If you make too many hatch marks then the drawing becomes to dense and then ruined. Remember it is not easy to see in the dark and then you have to take into account your eye adjustment between viewing the site and refocusing in the brighter light of your easel. As dark as the scene was I have made the trees light so as to create a negative space to hold the composition together. There is an abundance of light in the center of the lagoon as well as on the building in the background. The deep darkness of the center sky behind the skyline makes for a wonderful perspective drawing without vanishing points. 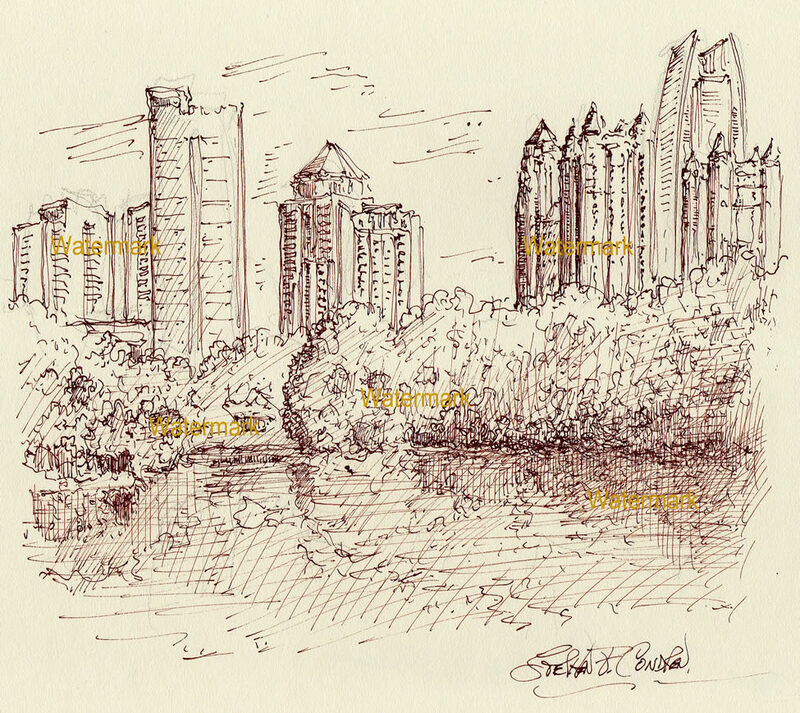 This article is about Atlanta skyline #024Z brown pen & ink drawing, which is for sale at discount with prints by artist Stephen F. Condren, BFA-SAIC, of Condren Galleries, a Fine Arts Gallery, offering JPEG & PDF scans. 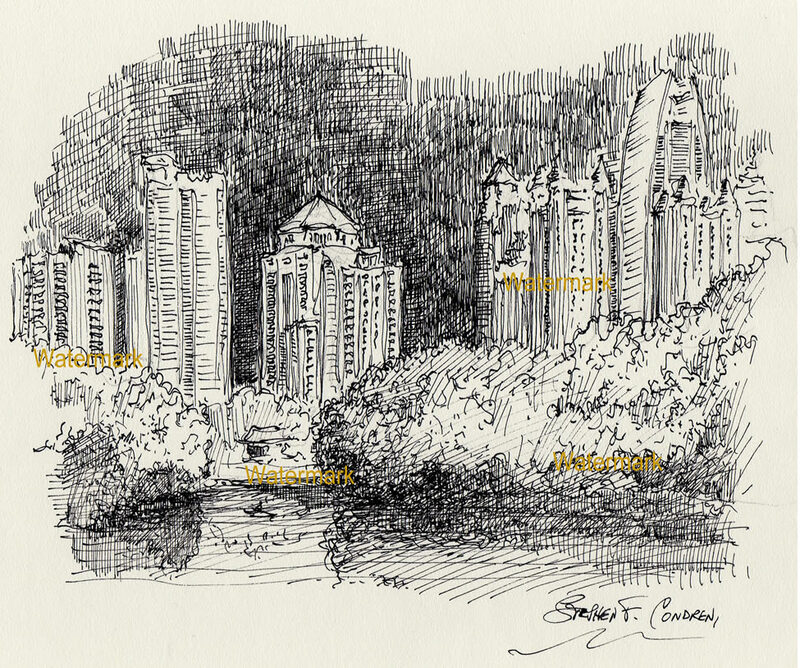 This article is about my brown pen & ink drawing of midtown Atlanta, Georgia, at Piedmont Park. The brown color ink make a nice tone to this lovely setting in Piedmont Park. So often black ink is used for pen & ink drawings, and I have a deep love for black ink. However, on occasion it is nice to try a different tone. My focus for this drawing really is the water. I have done a good job of capturing the rustling water near the shore line then showing the gradual dissipation of the waves as they enter the center of the lagoon. The shade and shadows of the tree line was essential in getting the effect. The trees and foliage are almost non-descriptive as their negative space make for a fine support for the tower skyscraper that stand behind them. This article is about Atlanta skyline #023Z pen & ink of midtown, which is for sale at discount with prints by artist Stephen F. Condren, BFA-SAIC, of Condren Galleries, a Fine Arts Gallery, offering JPEG & PDF scans. 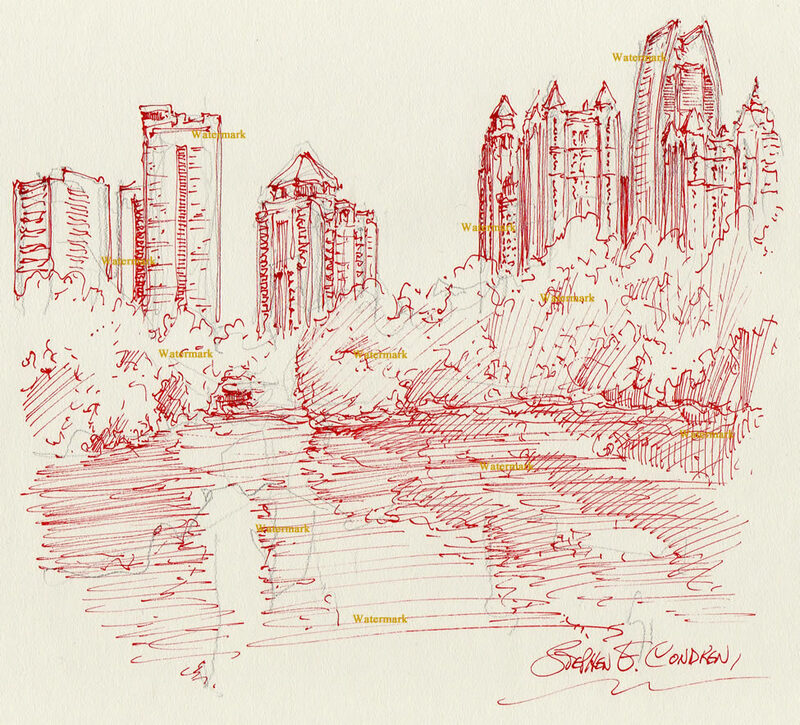 This article is about my red pen & ink drawing of midtown Atlanta, Georgia, at Piedmont Park. Have all of your art supplies ready and at hand. Position yourself far enough from the lake to gain a full perspective of the site. Study the relationship between the landscape and buildings that stand behind. This is a very popular view of midtown Atlanta, as seen looking across Lake Clara Meer to the skyscrapers of midtown. The lake is a wonder element that give a nice reflection that I utilize in both my pen & ink and watercolors of it. I have chosen red ink to bring out the warmth of the hot Atlanta summer. Since red is an intense color I have used it in such a manner so as to defuse it throughout the drawing. I have only made small and intense line work on the side of the buildings to convey shade and shadows. 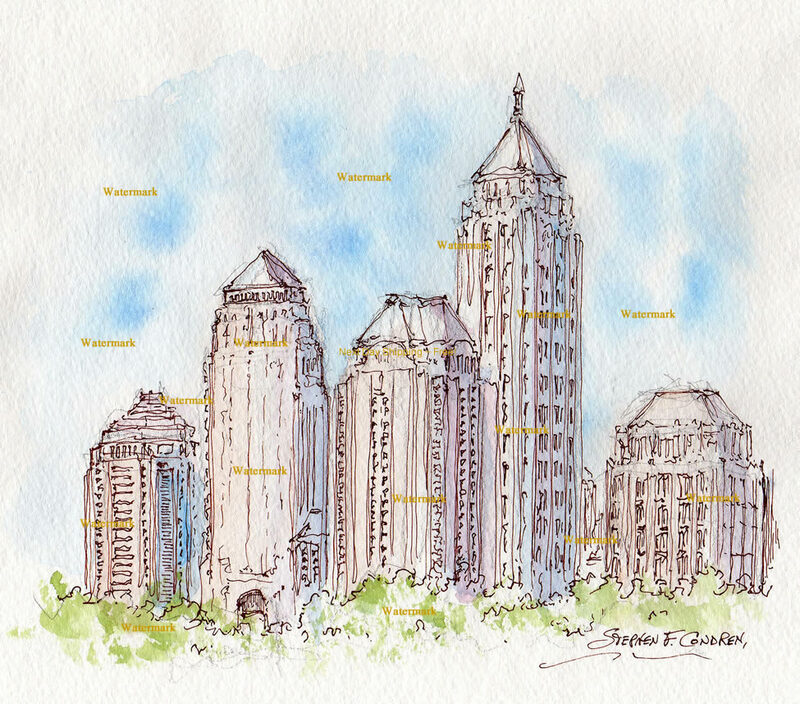 This article is about Atlanta skyline #022Z midtown watercolor, which is for sale at discount with prints by artist Stephen F. Condren, BFA-SAIC, of Condren Galleries, a Fine Arts Gallery, offering JPEG & PDF scans. This article is about my watercolor painting of the midtown Atlanta, Georgia, skyline. Midtown Atlanta, is located adjacent Piedmont Park and inside the park is the love lagoon name Lake Clara Meer. The setting of this park and lake make for a wonderful vista to paint your cityscape. Common views of midtown, Atlanta are seen looking across Lake Clara Meer. There is no doubt that this is a quiet and tranquil setting which makes for a great juxtaposition with the hustle and bustle of the vast city of Atlanta! I have chosen to make this watercolor from the lawns leading down to the lake, which cannot be seen here. Resting upon the grove of trees stand the towering skyscrapers that make midtown Atlanta so famous. I have made the skyscrapers the dominant element in the watercolor and used just the tops of the trees for the buildings to rest on. I am very pleased with the result for the buildings actually compliment the landscape rather than crush it.